the Feng Shui and Design of a modern office. 2) Internal door openings and passageways. 3) Qi flow and qi containment within the office. 4) Internal and external visibility. 5) Private v Public spaces. 6) Office and desks orientations. 7) Centre v Heart v Taiji of an office. 9) Office structure and group dynamics. 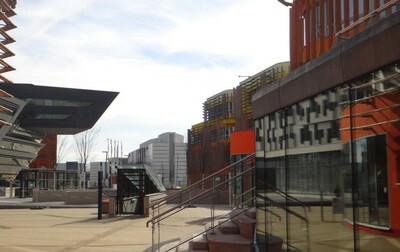 the European College of Feng Shui (ECOFS). You can download a Flyer in German HERE. One of the pleasures I get from teaching in Vienna is to get to see the city from a feng shui perspective, because Edith, my organiser often would put aside one day before the main course to do a feng shui study tour of different areas of the city. In the coming 3-Days Xuan Kong Da Gua Master-Course in October, we will do the same again: 3 hours of theory and 3 hours of walking tour. This time, on the 24 October 2014, we will visit the “The Golden Mile of Vienna” – Graben - Kohlmarkt – Tuchlauben, a very trendy and exclusive shopping area in the centre of the Vienna, with many famous designer shops. We will focus on the different aspects of the shop, in particular the front entrance or the qi-mouth, by famous designers such as Hans Hollein, Otto Wagner and Adolf Loos, etc. Do come and join us, just drop us a line and we will get you registered for the day. 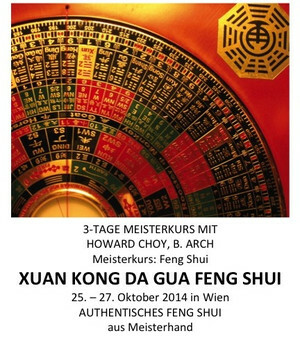 You can click the links below to download a flyer, either in English or in German, on the main course on Xuan Kong Da Gua Feng Shui, in the following 3-days (25 -27 October, 2014) after our walk-about. In China there were six Xuan Kong schools during the late Qing and early Republic era, but nowadays only two Xuan Kong schools survived, one is the more popular and more well-known Xuan Kong Fei Xing (Flying Stars) School made popular by Qing Dynasty scholar Shen Zhu-Reng and the other is the more secretive and less well-known Xuan Kong Da Gua (XKDG) system promoted by Zhang Xin-Yin about the same time. The term Xuan Kong stands for time and space and Da Gua stands for the 64 Hexagrams; the core of this system is based not on flying the stars but on using the Early Heaven Trigrams with the Luoshu numbers as applied to the Hexagrams to assess the Ji-Xiong (auspicious and harmfulness) of a situation, using the Coming Dragon, the Going Water, the Sitting and the Facing of a site as references. 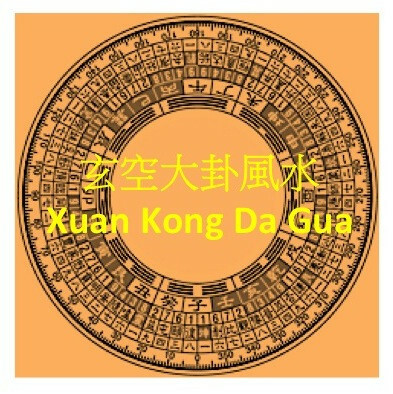 Xuan Kong Da Gua (XKDG) has its origin in the square-circle diagram of arranging the 64 Hexagrams as passed down to Shao Yong via Chen Tuan. It formed a map for the Gua Qi distribution for a site, where the Earth Qi is considered to be the Ti (the Body) and the Heaven Qi is the Yong (the Usage). You will find them on the last four rings of our San Yuan Bazhai Luopan compass. These four rings are very important and are the “keys” to unlock the secrets XKDG Feng Shui and XKDG Date Selections. The XKDG School of feng shui is different to but has a synergy with the Flying Star School of feng shui because when the Mountain Star and the Water Star in a Flying Star chart are combined together they form a Hexagram (Da Gua) as well. 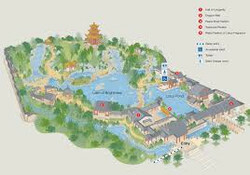 XKDG is a very useful system when considering the relationship between the Coming Dragon (the mountain behind a site) and the Going Water (the water in front), the sitting and the facing of a site, which can help us how to select a site and how to orientate the building on the site. This system complements the Flying Star well and at the same time we can strengthen our theoretical understanding of Xuan Kong (time/space) feng shui. Because in this system the compass reading of 360 degrees is divided into 64 Hexagrams of approximate 5 degrees each, it is a very detail and precise method. However the precision required may render it being impractical by some views, but nevertheless it is intellectually satisfying. Students who wish to deepen their knowledge Xuan Kong feng shui should study this system to take their professional skill and knowledge to a higher level. In this three-days advanced course we not only will teach you the basics theories of the XKDG system but also how to apply them it selecting a building or tomb site in practice. 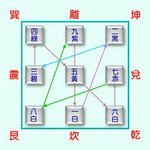 This is an unique opportunity for you to add another technique to your Compass ferng shui methods, but you will need to have a basic knowledge of how to recognize the Chinese characters for the 10 Heavenly Stems and the 12 Earthly Branches, as well as some of the fundamental concepts used in Feng Shui, like the Hetu, the Luoshu, Early and Later Heaven Trigrams and the construction of the 64 Hexagrams. Before coming to his advanced course, you are required to learn to recognize and be able to write the 10 Heavenly Stems and the 12 Earthly Branches as well as the 8 Trigrams characters. Chinesischer Garten in Sydney, klicken Sie bitte auf das Bild zum download einer Pdf-Datei des Workshops in Deutsch. 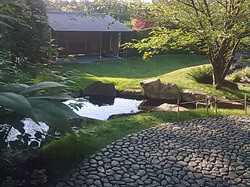 The Japanse Garden in the Garden of the World in Marzahn Berlin, if you click onto the image you can download a pdf file in English of the Garden Feng Shui workshop in Vienna from 11 - 14 April 2014. Experience the Qi of Vienna! Erleben Sie Wien und sein Qi! Klicken Sie HIER, um eine Pfd-Datei der Tour herunterzuladen. Die Weiterbildung und der kontinuierliche Austausch im Berufsstand der Feng Shui-BeraterInnen ist mir ein großes Anliegen. Daher veranstalte ich seit 2011 Fachfortbildungen sowie Meisterkurse mit Howard Choy. Die Workshops bieten die Gelegenheit an der Seite eines erfahrenen Lehrers die Feinheiten und „handwerklichen Fertigkeiten“ in der Anwendung von klassischem Feng Shui aus nächster Nähe zu beobachten und zu erlernen. Wir wenden sowohl Methoden aus Formschule als auch der Kompassschulen an. Teilnehmer sollten mit diesen Techniken vertraut sein. Wir freuen uns auf einen anspruchsvollen und praxisbezogenen Workshop in der angenehmen Atmosphäre einer überschaubaren Gruppe (max. 20 Teilnehmern). Der Unterricht erfolgt in englischer Sprache mit deutscher Übersetzung! Kursort ist Wien. 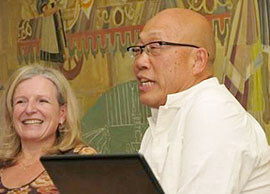 ist australischer Architekt und internationaler Feng Shui-Dozent. Er wurde in China geboren und wanderte mit seinen Eltern in frühen Jahren nach Australien aus. In den 80iger Jahren erlernte er Feng Shui in Hong Kong unter persönlicher Leitung von Meister Ren Zhilin und kann nun aus 40 Jahren Erfahrung in seinem Beruf schöpfen. Choy ist der Begründer des Feng Shui-Colleges in Sydney und er arbeitet seit 1992 beständig mit chinesischen Universitäten insbesondere mit Prof. Wang Yude und Prof. Cheng Jian Jun hinsichtlich des dort angebotenen Feng Shui-Studiums sowie in der Forschung zusammen. Regelmäßig tritt er als Redner bei internationalen Konferenzen und Symposien auf. Als internationaler Dozent kann er auf fundierte und weit reichende Erfahrungen zurückgreifen. 11 -14 Marz 2014 - Feng Shui fur Garden. 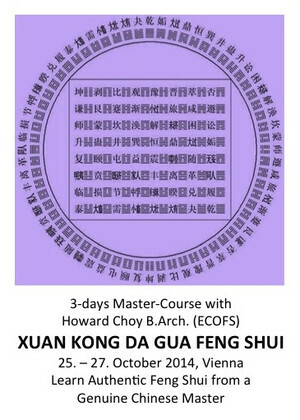 This 4-days course will start with a summary and an overview of the four basic patterns and the ten arrangements of the Feixing (Flying Star) charts, including new materials on the concept of “Shou Shan Chu Sha” (Receive Mountain and put up with Sha) on how to integrate the Star qi with the Form qi. Also, we will look at the working of two alternative Bazhai (Eight House) systems, namely the “Bazhai Minging” and “Yangzhai Sanyao”, where the reference points for calculating the distribution of the 8 Wandering Stars are different. It is assumed that the potential participants of this Master Course has completed some basic trainings in Flying Stars and Eight House, and know how to construct a normal star chart, as well as how to determine the directionality and the “Heaven’s Heart” of a chart. 2.5 Sample case studies from the old masters, including how to use two charts for the same house. 2.3 Sample case studies from the old masters using this methodology. 4.1 Master Shen’s Water Method. 4.2 The “Reversal” Water Method. 4.3 The “City Door” (Cheng Men) Water Method. 4.4 The “Seven Stars Robbery” Water Method. Part V: Advanced Bazhai systems including the four alternative systems and how to use two of them in practice. Part VI: On-site application with a real case study of a reasonable level of complexity, so the participants will gain a first hand knowledge on how a working consultant would use Flying Stars in practice. If you already have a good grasp of the Flying Stars and are looking for the “finishing touch” with a practicing Feng Shui Architect, then this is a perfect course for you. By the end of the course we hope to remove all the confusions you have in the past about the two major Compass schools of Feng Shui. You are also welcome to bring in your own projects for a second opinion and we will use them as part of the teaching practices, please inform the organizer before hand with full documentation (eg. Google Earth pictures, onsite pictures, floor plans and directional reading, etc) for a speedy feedback. Students from different schools are all welcome! In this first master class in Austria with Howard Choy, we will look at Feng Shui and the design of retail stores, where you can learn the advanced techniques of business Feng Shui to help the storeowners to achieve an optimum and attractive atmosphere that will increase customer patronage and sales revenue. The workshop provides tan opportunity to observe up close and learn from an experienced teacher, the intricacies and "craftsmanship" in the application of classical Feng Shui. We will use both the Form and the Compass schools methods so some knowledge of Feng Shui is required from the participants. You can look forward to a demanding and hands-on workshop in a pleasant atmosphere of small size study group of up to a maximum of 20 participants, all teaching will be done in English with German translation. You can down load a pdf file in German here. You can down load a pdf file in English here.